[Des Moines, IA] - March 9, 2018 - Skyline Dynovia, a business specializing in tradeshow exhibit designs and event solutions, is proud to announce national certification as a Women’s Business Enterprise by the WBDC-Midwest, a regional certifying partner of the Women’s Business Enterprise National Council (WBENC). “Having worked alongside many of the great women in our community as well as nationwide, it’s an honor to be selected into the fold of powerful Women Business Owners. As woman entrepreneurs we bring an incredible presence and particular savvy in the operation of our businesses. Knowing the bravery of those who paved the road before us inspires and motivates continued change. 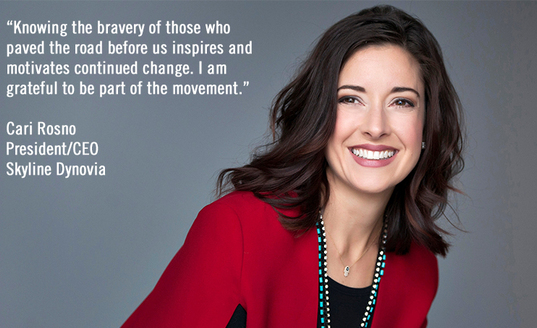 I am grateful to be part of the movement,” said Cari Rosno, President/CEO of Skyline Dynovia. WBENC’s national standard of certification implemented by the WBDC-Midwest is a meticulous process including an in-depth review of the business and site inspection. The certification process is designed to confirm the business is at least 51% owned, operated and controlled by a woman or women. At Skyline Dynovia, we specialize in connections. From the tradeshow floor to retail environments, we create purposeful experiences to enhance our clients’ brand. Our superior quality, custom-designed, portable or permanent exhibits are backed by Skyline’s 37 years of experience and commitment to excellence. With access to the hottest trends and latest products, we infuse technology and digital content with top-of-the-line graphics and an endless possibility of structures to captivate and engage your audience. Offering in-house design, custom interactive technology, tradeshow and event management, complete installation and dismantle services, and cost-effective rental solutions, we elevate your brand from start to finish. To learn more about Skyline Dynovia, please visit www.dynovia.com.